We tried making these beef and carrot biscuits for our Cocker Spaniel, Daisy. She loved them! We tasted one when they were cooked and they weren't bad, perfectly palatable to a human, (still quite soft) but I think we'll be keeping these exclusively for Daisy. We switched off the oven and put the dog biscuits back in to cool down and left them overnight. The next morning they were suitably crisp and crunchy. Can't wait to try some of the others! This recipe can be easily changed and still gives perfect results each time. I've used chopped chicken, leftover lamb, or whatever I've had to hand (almost) and every time they've been perfect - or so my dog says! LOL! I'm not much of a cook, nor do I really enjoy cooking (perhaps that's why!) but I so enjoyed making these dog biscuits for my cocker spaniel - she was so appreciative and seemed to know I was making them just for her. Ha! That's exactly what my cocker does too - when I'm peeling veg, I usually toss him a piece of carrot which he plays with for a while and then spits it out. I'm forever picking up bits of carrot from the floor. Great recipe by the way! Hi, I tried making these dog treats for my Cocker Spaniel, Warrington, and he loved them. I've made them a few times now and I've tweaked the recipe each time because I didn't have any ground beef. I used the leftovers from a beef casserole and I think the gravy must have added extra flavor because Warrington wolfed them down. I've also used a jar of baby food too. I didn't use the powdered milk and I cut back on the water until I got the mixture to a thick dough. I think this is a versatile dog biscuit recipe and, using your common sense, you can substitute pretty much anything you like. We tried these - both soft and hard - and our cocker spanie, Jack, absolutely loved them. I think the beefy taste is what he likes because when we give him raw carrot to eat he just plays with it for a while and then spits it out! Join in and write your own page! It's easy to do. How? 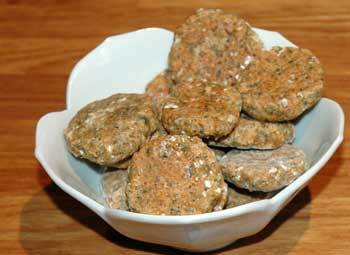 Simply click here to return to Dog Biscuit Recipes.